← Look at all these hamsas! 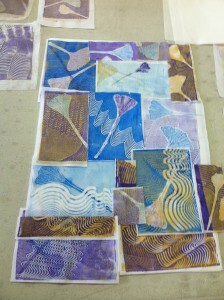 Last month’s EBHQ workshop was jelly printing with Lisa Thorpe. I took a few real ginkgo leaves to print with, rather than using her stencils. She also had a couple combs that I used, as you can see above. We used a kind of acrylic paint that has the word, ‘open’ on the label. This means that the paint dries slower, so you have more time to work with it. I’m really excited about the September EBHQ workshops with Maria Shell, from Alaska! One of them is called Kitchen Sink Quilts. It seems a lot like Gwen Marston’s Parts Department quilts. It will be interesting what the difference is. The homework for this class is to bring in 9 orphan or leftover blocks. I have lots more than that. I have a lot of UFOs from all the workshops I’ve taken. This entry was posted in Classes, Work In Progress. Bookmark the permalink.